When I shared the Kitty Vending Machine on Friday, I mentioned back to school and all the busyness that entails. Well, it seems that during the crazy last week, I forgot to share my Summer of Stitching design for the I ❤ Musicals theme! I now have one kiddo back to university for her second year and one about to return to high school for his junior year, so life is starting to calm down a tiny bit. Now I’m here at 7:30 in the morning to share! 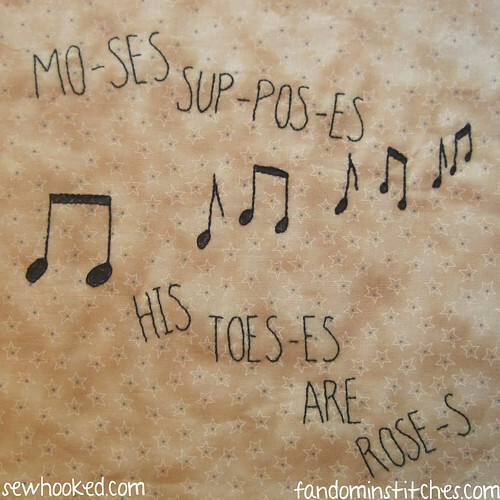 I had a lot of fun stitching this one and have been singing Moses Supposes off and on ever since! Singing in the Rain was a favorite of both of my kids when they were little and it’s still one of our favorite family movies. Need a song stuck in your head today? Here you go! I’ll be back tomorrow with Talk to Me Tuesday and (hopefully) my new design for this week’s theme on Fandom In Stitches… Star Wars! This entry was posted in -sewhooked website- and tagged gene kelley, hand embroidery, moses supposes, singing in the rain on August 18, 2014 by Jennifer Ofenstein. Believe it or not, I’ve never seen that before. And I do love watching men dance! Oh, I do recommend it! It’s a fun little piece of history as well as being a good musical!